Europa is the sixth closest moon of Jupiter and is the smallest of the Galilean moons discovered by Galileo. The other Galilean moons are Io, Ganymede and Callisto. Even though it is the smallest of the Galilean moons, Europa is still the sixth largest of the 181 moons in the solar system. Europa is a frozen, icy world and is a unique object in the solar system – scientists believe that beneath the frozen layer of ice on Europa’s surface, there is a salt-water ocean in contact with a rocky seafloor. If this is proven to be true, Europa may be a promising place for life to exist beyond Earth. Europa was officially discovered on January 8, 1610 but Galileo may have actually discovered the moon the day before. He was using a low-powered telescope and couldn’t actually distinguish Europa from the other Galilean moon Io until the next day. The discovery of Europa and the other Galilean moons lead to the discovery of a Sun-centred solar system. The discovery of these moons of Jupiter by Galileo is what eventually lead scientists to the understanding that the Sun was the centre of our solar system, with the planets orbiting around the almost stationary star. Before this, it was believed that the Earth was the centre of the solar system and the planets orbited around Earth. The moon is named after a Phoenician noblewoman who became queen of Crete in Greek mythology. Europa was a noblewoman which the continent of Europe was named after. Europa was abducted by Zeus – the Greek counterpart for the Roman Jupiter – after the god of the skies transformed into a bull. He took her to the island of Crete to be his lover. She became the queen of Crete and had a number of children with Zeus. Europa is the smoothest object in the solar system. The surface of Europa is made of frozen water and has the smoothest surface of any other objects in the solar system – i.e. it lacks large features such as mountains or craters. There are very few craters on the surface of the moon because it is tectonically active and relatively young. Europa is about 4.5 billion years old but its surface is only 20 to 180 million years old. The moon is one of the brightest objects in the solar system with an albedo (light reflectivity) of 0.64, one of the highest of all moons. This reflectivity suggests a young and active surface to Europa of somewhere between 20 and 180 million years – much less than the moon itself with is around the same age as Jupiter, 4.5 billion years. Radiation on Europa is high enough to kill a human being in one day. Radiation levels on the surface of Europa are around 5400 mSv (540 rem) per day, a dose which would cause severe illness and death in a human being exposed for just one day. Like Io, this radiation is the result of solar radiation and energetic particles produced by Jupiter’s very strong magnetic field. Europa has a liquid ocean of saltwater beneath its surface. 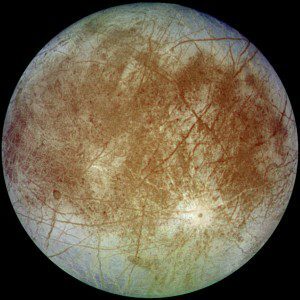 Scientists believe that there is a liquid ocean somewhere around 100 km (60 miles) beneath the thick, icy crust of Europa. It is thought that the tidal affects between Europa and Jupiter are what heat and keep the water in a liquid form. If it is proven that this ocean exists, Europa may be one of the most promising places in our solar system, beyond Earth, to search for life. Europa may have twice as much water on it as Earth. If the scientists theories prove to be correct, the estimated volume of water on Europa is approximately 3 × 1018 m3. This is slightly more than double the volume of water in the oceans on Earth. NASA’s Galileo mission is responsible for most of what we know about Europa. Launched in 1989, the Galileo mission took 6 years to reach Jupiter and it remained in orbit from from December 8, 1995 until September 21, 2003. It provided the most detailed examination of the Galilean moons to date with numerous close flybys of Europa. Europa and the moons of Jupiter have also been visited by a number of other spacecraft – including Pioneer 10 and 11 in 1973 and 1974, Voyager 1 and 2 in 1979, and the New Horizons mission as it flew through the Jovian system on its way to Pluto and beyond. One day on Europa lasts as long as one year – 3.5 Earth days. One day on Europa – the time it takes for the moon to rotate on its axis – is 3.551 Earth days. It also takes Europa 3.551181041 Earth days to orbit Jupiter. This means that a day on Europa takes the same length of time as one year on Europa. Europa is tidally locked to Jupiter. Like almost all moons in the solar system, Europa is tidally locked – locked by gravity – to Jupiter and the same side of the moon always faces the planet. Europa has a very weak atmosphere. Europa has a weak oxygen atmosphere which is most likely because of charged particles from the Sun hitting water molecules on it’s surface. This breaks those molecules into oxygen and hydrogen atoms. The hydrogen escapes the surface of Europa but the oxygen is left being – leaving a tenuous oxygen based atmosphere.